Here is a list of French verbs followed by the preposition “de”. As I mentioned in my list of French verbs followed by “à” , I couldn’t find any rhyme or reason why this is the way it is. I suggest you try to memorize them. The best way to memorize the right preposition for a French Verb is to copy the list of French verb + preposition onto French flashcards. Then use your French verb + preposition in sentences that make sense to you, connecting them to your own life experiences. For example, to illustrate “avoir peur de” I could write “j’ai peur des araignées” – I am afraid of spiders, which is true, and a statement that makes sense to me: I would remember this statement longer. 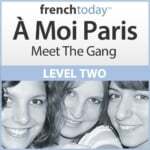 Start by making a smaller list of French verbs + prepositions which YOU are likely to use. Illustrate them with your own sentence and memorize them. Then come back to this article and add to your list. Revisit often! Repetition is the key. To make it clearer, I’ll use “faire quelque chose” as my second verb, but you could replace it with any other infinitive that makes sense. To make it easier, I’ll use “Pierre” as my noun, but it could be a thing as well, not necessarily a person. Note that this preposition “de” will contract with an article, hence becoming “du” or “des” if need be. Note also that many of these expressions will involve the French pronoun en when followed by a thing (if it’s a person, you’ll need a stress pronoun). avoir envie d’une pomme – to feel like (eating) an apple. Watch out “avoir envie de Pierre”, so used with a person, mean to want that person sexually. Que penses-tu de Pierre ? – what is your opinion about Pierre? If you know more COMMON French verbs followed by “de” + verb in the infinitive, please leave a comment below, or contact me, and I’ll add them to the list. Merci! 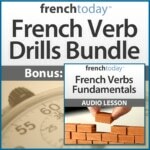 The very best way to memorize French prepositions is to learn them in context: check out French Today’s downloadable French audiobooks: French Today’s bilingual novels are recorded at different speeds and enunciation, and focus on today’s modern glided pronunciation.